Hi all, hope you had a great weekend! A few weeks ago, I mentioned that one of my home goals for this year was to take a bare patch of wall in my kids play space and turn it into an art and homework station. Many many moons ago, before the little ones were born, I actually had a ‘formal’ dining room. Ha! Those were the days when we had an entire room dedicated to formal dining. No point in that these days, so after those babies were born we decided to better use that square footage to store their toys, games, etc in a kid friendly space. There was a bare unused patch of wall in there, so over the weekend I created a little art desk and wall gallery for my daughter. Art is her most favorite activity ~ drawing or painting is the first thing she wants to do when she wakes up, and the big excuse she uses to wiggle out of her looming homework. I decided to encourage her talents and dedicate a little station to my budding artist. Her older sister gave her the desk from her bedroom, so that meant I didn’t have to buy one! Yeehaw, gotta love shopping your house for the perfect solution! I gave it some grosgrain ribbon trim around the edges for a fun pop of color. I had a glass top made for the small desk at a local shop, then to add a fun pattern, I layered a simple cotton print fabric underneath the glass ~ it’s stapled underneath so it will stay in place. The small lamp is from Target, I added some fun ribbon to the shade with hot glue. I thought about taking a trip to IKEA for some floating wall shelves, but then luckily I found some laminate ones on clearance at my nearby Target. I primed them with oil based primer, then gave them a quick coat of white paint! No one has to know they were two different colors before ! Most of the picture frames are Goodwill finds, or found on discount at either Michaels or Target. 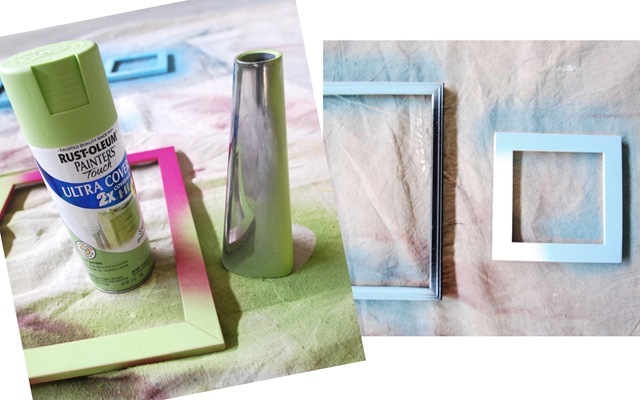 RustOleum has a fun line of ‘Painter’s Touch’ colors like ‘Aqua’ and ‘Green Apple’ ~ they make it easy to change a frame’s color with just a can of paint. Together, my girl and I went through her stack of her drawings and paintings, and she picked a few recent favorites to frame. The nice thing about a gallery like this is she can change out her drawings so easily. Here’s a peek at the other walls in their play area. Here is the TV/storage wall and the laminate media center I painted last year. On the other side of the media center is the sofa with a giant map behind it. This wall map is from National Geographic and comes in three vertical sections. It’s easy to get up on the wall ~ I used a staple gun to attach it to the wall and double sided tape to keep the seams together. To create the frame, I trimmed it with MDF chair rail after I spray painted it espresso brown. The map can be purchased here. Opposite the new art desk and gallery is this window wall, above it is the wood cornice I built last summer. The rug is from Rugs USA, available here. This bonus room downstairs is a great play space for art, games, movies and entertaining their friends, and we think a much wiser use of square footage than a formal dining room. And my daughter just loves her new art gallery wall! I’ve got another fun project to feature later in the week, but today I’m packing my luggage. Yep, it’s another airplane trip, this time I’m headed to the Blissdom conference in Nashville. I’m very excited to meet up with so many of my home blogger friends who inspire me greatly. 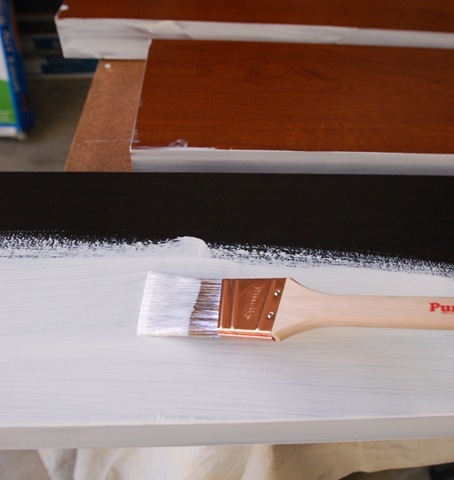 What DIY projects do you have in the works right now? What a great room! I love the way the desk turned out :) And the wall art! Gosh I love your site! Thanks for sharing all your wonderful ideas! I love this idea! You inspire me to be better and more organized in my home. This is a project I am going to do in our home as well. Thank you! What a pretty, yet functional use of your space! 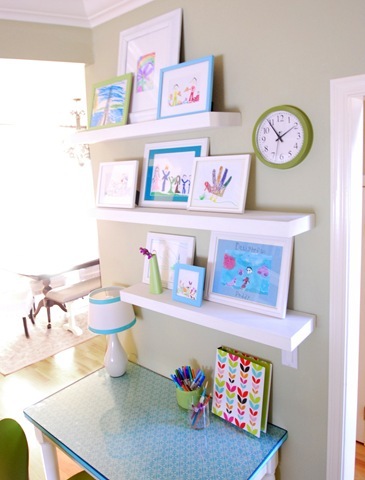 I love the idea of floating shelves…no constant hammering, nailing, or touching up. Do you use any kind if adhesive to keep the glass to stay in place on top of the desk? Love the little touches that make the space pop–the ribbon, the fabric. Great job! Our addition opens directly off of our dining room. For a couple of years now it’s sort of been in limbo. Is it a playroom, another “room,” or what? I have my craft desk in the back hallway, but I rarely use it. I think it’s time to turn the entire area into a dedicated play room to give the kids more space. Since my oldest moved into a bigger bedroom with her little sis, I could turn her old room into a guest room/craft space. I love this space. You inspire me to be more organized in my own home. Organized and pretty! Thank you for sharing. I love everything about that room. It’s kid enough, but busting with plastic toys everywhere. I love the desk area and wall art. Beautiful job, as always! I meant Not busting with plastic toys everywhere. I think I type too fast! Oh my goodness, I am in love. This is fabulous. I love the fresh colours, and all the little whimsical details. Awesome job! Awesome! I actually have that fabric you used on the desktop saved in my files. I also love the ribbon as trim. You are such an inspiration! How imaginative! I am sure your little artist is loving her new space! Just curious, where is your dining space now (the one that can be seen in the background of the first two photos? Is that part of your kitchen? A floor plan post would be super-helpful for those of us who love to follow along! Please come stay a weekend at my house and help me with my house projects/problems!!! I neeeeeeeed you!!!! Beautiful work! I love the apple green and aqua together – what a great combo! I need to get my kids an art station because my husbands’ great-great-great grandmother’s antique dining room table just can’t handle their abuse. Thanks for all your great ideas and inspiration! What a great idea for the desk. I love the fabric and ribbon choices. Considering how few times a year any of us really use a formal dining room, it’s a great alternative to using the space. Beautiful job as always. i am in love with the fun and bright colors! i love having kids artwork up, too- it’s so fun and whimsical! and they are so happy and proud to have their work hanging in the house! As always, another great post! We did the same thing with our “formal dining room” – made it a playroom. It’s a nice sized room with a bay window and where all the toys (are supposed to) stay. (or atleast end up in at the end of the night). My current DIY is adding the National Geo. 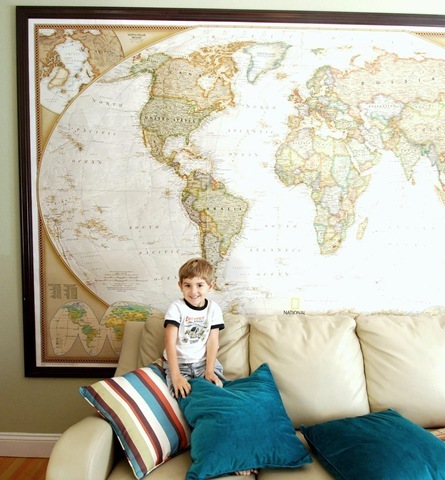 world map into the playroom! I actually ended up getting the next smaller size – it’s still huge but was just 34.99. Now just need to frame it out, hopefully this week! I’m also adding a playroom wall gallery with framing jacket covers of some of the kids favorite books. Safe travels to Blissdom! I can only imagine the memories that will be made in this fun and beautiful room. Thanks for sharing the easy ideas you used in the transformation. What a sweet area for your little girl! I love the art gallery you created. 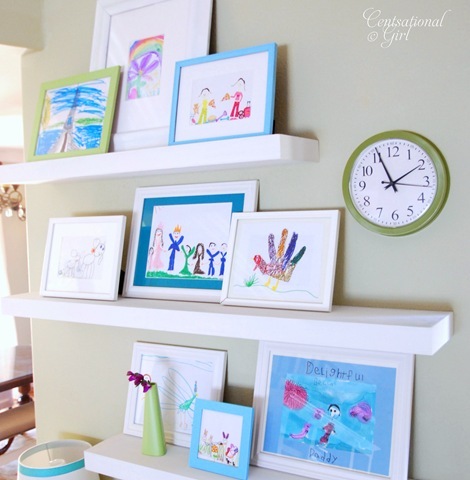 Emily A. Clark is actually guest posting on my blog today about incorporating kids’ art throughout the house, and this is another perfect example! And, I recognize that green clock from Target; I picked up the yellow version for our nursery…love that pop of color. Have fun at Blissdom! So wishing I could go, but my little newborn is keeping me grounded! I love that your kids have their own space! It’s a great way to show off their creativity. Hopefully, it makes them accountable for keeping it picked up too. A good lesson in pride of ownership. Great space and great ideas. Have fun at the conference! Beautiful and functional and exactly what I want to do with my unused dining space. How big is this room, it seems to fit so much stuff. Thanks for sharing. 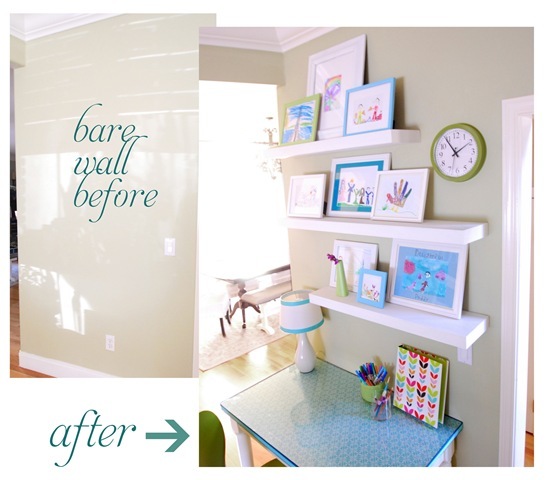 What a fun space…And more proof of the power of paint! This is beautiful! I love how bright and cheery the room is, without feeling too “kid” like. The gallery wall and patterned desktop are brilliant ideas! It looks like it could easily be updated to grow with the kids in the future. Kate, you never cease to amaze and inspire me! i love what you did to the desk. Great idea using fabric and glass! i am working on putting elfa in my laundry room…or shall i say closet. it has turned out so well, and i painted the walls with a beautiful silver gray to pick up on the stainless in my washer and dryer. i love the extra storage and the cabinet space in the kitchen i just freed up!! yay for projects getting done. next up….master bedroom closet in elfa. This is so fun, I love how a little ribbon trim can go a long way. Right now the hubby and I are working on our nursery for our first baby! He just installed new baseboards (thank you YouTube) and painted the walls w/no-VOC paint. I’m busy making small works of art for the walls and hope to start doing the curtains soon! That is so cute! I love the colors. Your daughter does great work on her paintings and they look adorable framed and hung on the wall. Nice work! So cute! I love the map on the wall, what a great idea…stylish and educational! Adorable space! I absolutely LOVE, LOVE, LOVE that room! The colors are BEAUTIFUL! I am in love and totally diggin’ it. Can I come over and play? Hehe..enjoy it! You have inspired me! Love it! My daughter would love a space like this. Just have to figure out the perfect spot for it. Great job. I spied a brown and white pillow on one of your chairs that would be perfect for our playroom, do you know what the name of the fabric is? So cheery! LOVE the colors, and the framing of the art. Ribbon on the lampshade is genius! Nice work. What a beautiful, fun room for the kids. I love the giant map and the desk turned out beautiful. I love that you displayed some of their favorite artwork. I bet the kids love hanging out in there. Thanks for the beautiful inspiration once again. Ever since I found your blog…my DIY projects have tripled!! ; ) I’m really not kidding! The Board and Batten was the beginning of it all! I have tons of projects right now and I just blogged about them all…but it might be months before they all get finished! I LOVE this room…too bad I only have boys. (Well, not too bad, ’cause I love them dearly). Anyway, I love those frames. Do you have to sand and prime them first or can you just spray paint them? I’m REALLY new to all this DIYing and am SUPER excited to tackle some projects. The frames are one of them. Thanks. Love this idea for kids art. I have a floating shelf wall (ikea) in my bedroom but it displays all things about me and my husband. Thank you so much for sharing…love your ideas and I’ll be stopping back often! That is a beautiful space! It looks at once modern and kid-friendly. Thank you for sharing this- it gives me inspiration to work on my project. I’m redoing my office, and I can’t spend any money! That’s proving to be quite a challenge! Happy Monday! I love that play room. I wish we had the space for it, but we are actually planning on using our dining room. I have loads of drawings and things I could hang too. I will have to try that art gallery myself. So cute. Wow!! That’s amazing. What a fantastic use of space. I love it. The ribbon detail is adorable! Love that extra little piece of this project. I think it was kismet that I read your post this morning! Since the Christmas overflow of toys, we have been contemplating turning our formal dining room into a playroom as well. Since it is one of the first rooms you see when walking into our house, I’ve been a bit hesitant because I didn’t want to have toys strewn about as a meet and greet. But I am now convinced you can have a stylish playroom that doesn’t scream toy overflow. Thanks for the inspiration! This is absolutely a fabulous idea. I have a budding artist in our home, too, and while I don’t have a formal dining room, I could do something similar in her own room or in the play area we have upstairs. Love that you are so economical and resourceful… a girl after my own heart! Thanks for the great ideas! Amazing! The funny thing is that I JUST found that same map from National Geographic and am planning on using it in my newly constructed basement “billiard room/Library”. As avid travelers, we’re going to use little push pins to mark all the places that we’ve been. We figure it will be a nice way to remind ourselves where we’ve been and will be a good conversation starter with friends and family. Great minds think a like! LOVE everything that you did! The colors are so cheerful! I love the map too. I have a feeling that website is going to get flooded with map sales today! Great job! You are seriously unbelievable. That map is fantatstic! I LOVE that you do all of these projects yourself! You are so inspiring! Great art area for your little artist too! Can I come over and play in that room?!?! It’s so wonderful! Cover-Stain Oil-Base Primer-Sealer SPRAY paint? Seems like it would be less messy (when done in an outdoor space) but I wasn’t sure if it would cover heavily enough to be effective on laminate. I love the art wall! AWESOME! My current project is making use of an old door that was part of a wall divider in our church. Years ago, they had these to shut off areas for Sunday School classes. It has raised panels on it and the top part has a frosted glass insert. I’ve had the door for years and just used it as a piece of art….it stood up against a wall. It’s still the original color (a pinkish-tan color)…of course it’s aged a ton! But it doesn’t go well with my new home, so I’m in the process of stripping the hold paint off it and staining it a chestnut color so it will look like it belongs. This is fabulous!!!! Love the colors you used too. I just framed a bunch of the kids art, they love it. This is just so flawlessly done. 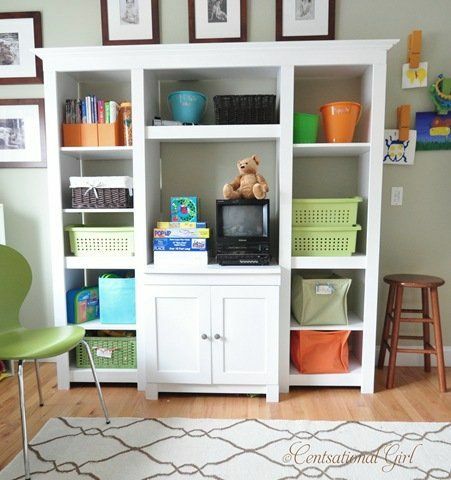 Such a perfect use of space, I love that your kids can play and create so close to the heart of the home!! I also love all the colors you chose, everything looks so divine!! 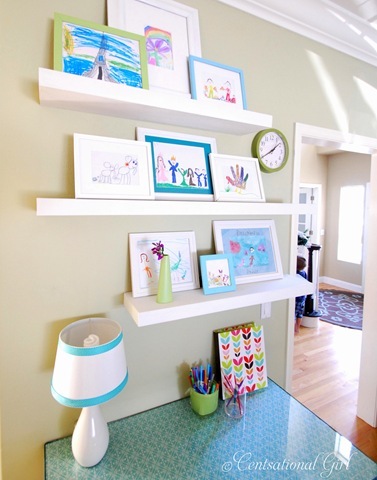 My girls would love their own little art center… great use of space. 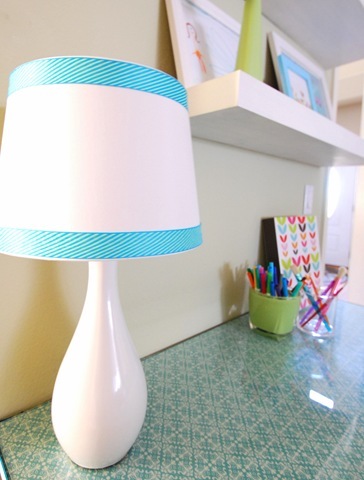 Love the ribbon’ed desk & lamp… super cute! Oh, this whole room is amazing. I am in love. I almost ordered that wall map for my son’s room. Just great. The desk is perfect and I like the pops of color. How lovely for your children. Yours is way more impressive, but I’ve just put up our own kiddie gallery. Looks great! 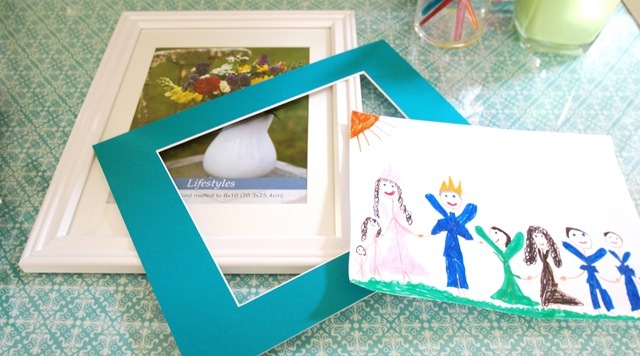 I love framing kids art! Love how you repurposed the dining room for what fits your world! The art desk is precious– lots of great ideas all in one. What a lucky little girl! great versatile room, and you did a beautiful job with all of it! Could you tell me the paint color on the walls? I’m looking for a pretty green right now, and I believe the one you used could be it. I love the fabric under the glass. Great idea. I so have this in mind for my rumpus room downstairs… thanks for the inspiration! I also love the idea of painting the photo mats in the picture frames, and will now be doing this in my daughter’s bedroom. Keep up the great work. Kate- it’s amazing! I love the print on the top of the desk. I have tons of those same frames from Michaels that I did my gallery wall in (: It’s so bright and cheerful! This post made my heart happy!!! LOVE what you did with the artwork and the media center!!! The same National Geographic map is above my desk in my studio. ;-) I ordered mine at AllPosters.com and had my local framer frame it. 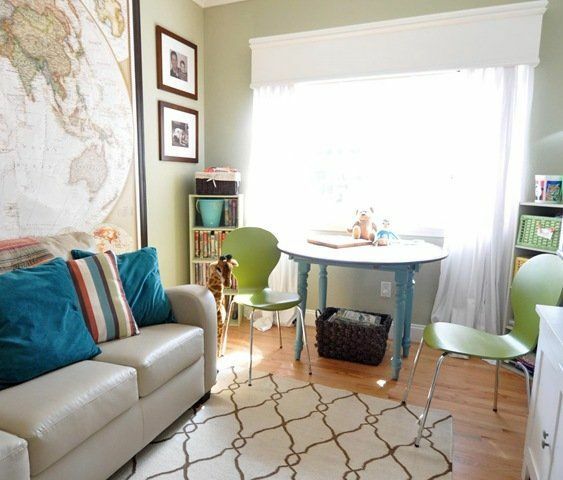 What a wonderful and colorful space for your daughter to create her masterpieces. She is quite the budding artist with all of her artwork. Good for her! The fabric on her desk is a fun touch, Kate. You did a great job with everything. Have fun at Blissdom. I would so love to go but I’m still in the “reader” phase of blogs. Soon I’ll start my blog and hopefully next year I can attend. It would be great to meet you. Is the staple gun pictured the same one you used for the map? I’m interested to know where the staples were placed as I’m interested in hanging that map very soon! I want you to come and fix my house….I love you! Awwwwe! So much fun! I love it! LOVE that room! I adore all the blues and greens. And that map is so awesome – I wish I had a wall big enough for something like that! Hand turkey!!!! !, I just love them. My children used to do them at playcentre. Im sure Ive got some tucked away. Mmmmmm…..
Love this! Great colors. Cute way to encourage your daughter’s talents. I’m continually impressed by your projects. This is so practical & fun! I’m sure your girls love it… as do your readers! Adorable! I love that fabric on the desk- I’m actually using the same fabric in a quilt for my (grown) daughter. What is the name of the aqua fabric you used on the desk? It’s lovely! Wow, love it. Most of my DIY stuff is complete, but seeing this is giving me new ideas. This room makes me wish I were a child again! 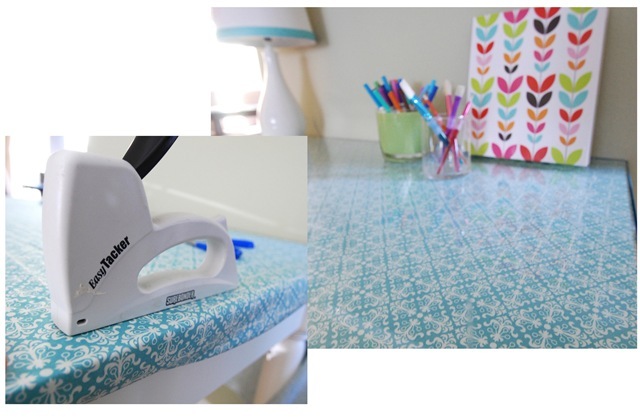 I absolutely love how you brightened up a simple desk with a bit of fabric – genius! And the ribbon on the lamp was a small detail that made such a big difference! The whole set up is adorable!! A plethora of amazing ideas! Thanks for sharing. I love the attention to detail. It’s all so special. I love the glass table top over the stapled fabric. I am doing this asap to my desk at work. Love Love Love it! I purchased this map! Can’t wait for it to come in the mail!!! I just purchased the map as well after debating for awhile. i found it on amazon for only $63.00! Wow, lovely!! Hope to see you at My Dream Canvas! I love this room! The orange and turquoise striped pillows are amazing, where can I find some of my own or fabric to make them? How did I miss this lovely gallery wall earlier this year? Sigh. Everything you do is so beautiful Kate. Thank you for sharing with the Gallery Wall party!! Such a pretty, happy room. I have a little “creating corner” for my toddlers with a laminate desk top. It’s pretty grubby with paint and crayon! 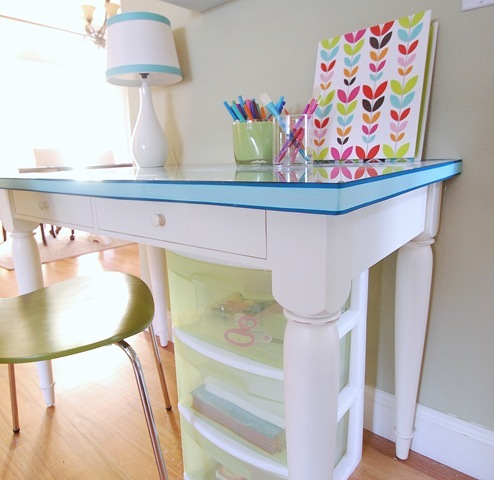 I’m taking inspiration from the glass covered fabric desk, much prettier and it must be easy to keep clean too. Thanks for the inspiration. Visiting from the Gallery Wall Party, I’m # 117. How wonderful! I bet your daughter feels so special! I love this! I have never used spray paint for anything (I know!) so I love what you did with the mats in the frames. Adorable space! I love everything about your blog! Keep it coming! I have all the supplies to put up my National Geographic map on our office wall. Do you recommend cutting the chair rail and then painting? Also, I assume you nail the chair rail to the wall. How do you paint over filled nail holes with spray paint? It seems a bit scary to me. Thank you! where did you get those big clothespin clips on the wall? So glad to hear I am not the only person to fore-go the formal dining room and make a TV/play area for my kids. I have had one for years – not as cute as your is though. Now my kids are older and have their own homework desks in their rooms and we’re currently making it into a room that they can hang out in, play Wii, play games, etc. I love having that room available to us. Thanks for all of your wonderful ideas. I love this! This is such a great idea! :) Right now we’re expecting our first baby, so our whole house is sort of one DIY project right now. Art work is still way off for us, but definitely storing this in my memory bank for when the time comes. Too cute! I Have only Just found your blog on Pintrest!! I LOVE IT!! Thank you for sharing!! Great Ideas!! Absolutely fantastic! I will definitely be making my own version!